Mail services in Canada have been suspended due to an on-going industrial dispute which has already been causing delays to mail in some areas. Due to this dispute Canada post has now suspended all mail operations across the country. Mail sent since the 10th of June is likely to be affected by this and will be subject to delays. Any mail already in the system is being retained until clearance is given by Canada Post that it can be accepted for delivery. Mail bound for the UK from Canada will also not be dispatched at present. Customer should expect delays to all Canadian bound mail during this time. 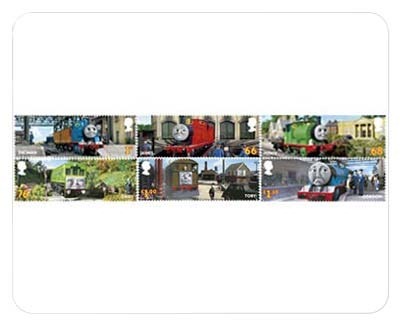 The latest stamps released from Royal Mail will feature popular characters from the children's TV series Thomas the Tank Engine. The characters from the series Thomas the Tank Engine and Friends were created by the Reverend W Awdry. Thomas will feature on the 1st class stamp, James on the 68p stamp, Percy on the 76p stamp and Daisy on the £1.00 stamps. The stamps will be available from the 14th of June.